21 tracks: The Occasionals - The Shanty Set * Ross Ainslie, Freeland Barbour & Gary West - Laxdale Cottage / The Pitlochry Highland Games * Billy Kay - Destiny * Phil Cunningham, Freeland Barbour & Neil MacMillan - The Craic at Clashmore Hall / The Drampire * Cunningham, Barbour & MacMillan - Frank McConnell’s Three Step / Cape Ann * Cunningham, Barbour & MacMillan - Atholl Braes / The Drunken Piper * Cailean MacLean, Jane Gardner & Freeland Barbour - Oran Badantarbairt / Badentarbet / Northlins * Freeland Barbour, Jane Gardner, Mairi Campbell & Alison Smith - Remember Them With Gladness * Freeland Barbour, Jane Gardner, Mairi Campbell, Alison Smith & Kevin Macleod - Kvalnes Reinlender * Freeland Barbour & Janet Barbour - In The Lamplight * Martin Carthy - High Germany * Gary West - Pasacorredoires de Ponteareas e Vilaba / Aires de Pontevedra * The Occasionals - The Whittingham Rant * Martin Carthy - My Son John * Ross Ainslie - Lullaby For Mel / Chris Grace’s Jig / Reel of Beer * Simon Thoumire & Freeland Barbour - Chastleton Triple / Black Dog’s Hornpipe * Simon Thoumire - Joseph Boseph Set * Ross Ainslie - Jock Brown’s 70th / Tain In The Rain / High Drive * Freeland Barbour - With Stinging Eyes and Straining Thighs * The Occasionals - Kevin Macleod’s Medley * The Occasionals & Guests - Sarah’s Reel / Sam’s Reel. 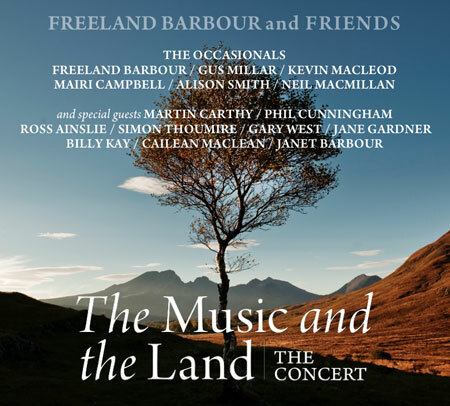 With the stunning photography of Cailean Maclean and over 450 of Freeland Barbour’s compositions, The Music And The Land - The Music Of Freeland Barbour (a sumptuous 2-volume book in a slip-case) is a wonderful tribute to Scotland’s landscape and traditions. The book was published by Birlinn Ltd in October 2015 and launched with concert/ceilidh nights at The Queen’s Hall in Edinburgh and The Old Fruitmarket, Glasgow. This album The Music And The Land - The Concert contains much of the magic of these two nights, a chance to hear just a few of the compositions from the book, and also to hear music from the distinguished list of performers. Everyone in the concert had also made a contribution to the book in some way and this made for a wonderful atmosphere and, in the words of author James Robertson, “A book launch like no other”. The album includes contributions from The Occasionals Ceilidh Band - comprising Freeland Barbour (accordion), Mairi Campbell (fiddle), Alison Smith (fiddle), Kevin Macleod (tenor banjo and mandolin), Gus Millar (drums) and Neil MacMillan (piano) - with guests Martin Carthy (songs), Phil Cunningham (accordion), Ross Ainslie (smallpipes and Highland pipes), Simon Thoumire (concertina), Gary West (smallpipes), Jane Gardner (piano), Jane Barbour (piano), Billy Kay (speech) and Cailean Maclean (speech). These guests appear solo and in various combinations with Freeland which makes for a wonderful album of real listening pleasure. Tracks include not only Freeland Barbour’s compositions but those of Phil Cunningham, Gordon Duncan, Simon Thoumire and more, plus traditional tunes. There is a track in tribute to the late Johnny Cunningham, Gordon Duncan, Andy M Stewart and Jim Barrie played by Freeland, Jane, Mairi and Alison, plus a track consisting of three classic Gordon Duncan tunes played on the pipes by Ross Ainslie, a friend and admirer of Gordon Duncan. There are many other highlights on the album, including Freeland sharing sets with Phil, Simon, Gary, Ross and of course stand-out tracks by The Occasionals. Not forgetting of course two songs from the master: Martin Carthy. The album was produced by Freeland Barbour, recorded by Garry Boyle and mastered by Stuart Hamilton at Castlesound Studios, Pencaitland. Design is by Mike Garden at Birnam CD. Front cover photo by Cailean Maclean.